SAN MATEO, Calif., July 23, 2018 -- Marketo, Inc., the leading provider of engagement marketing software and solutions, today announced it is partnering with Bombora, the leading provider of B2B intent data, to offer its services to new and existing Marketo customers globally. Built on a recently announced native integration, this relationship makes Bombora's Company Surge™ intent data available to all Marketo customers. 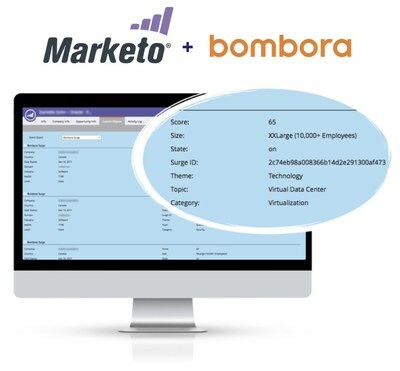 In addition to intent data, Marketo has teamed up with Bombora to offer best practices and campaign setup so customers can immediately experience the value of the integration. "As a marketer, the best buyers to engage with are the ones that are already actively researching," said TK Kader, senior vice president of strategy and alliances, Marketo. "Providing intent data from Bombora to our customers creates an opportunity for them to engage with buyers who have a high propensity to buy, ultimately delivering better pipeline to sales and increasing the velocity of the sales process." Couchbase uses the new integration of Bombora intent data inside of the Marketo platform to focus resources on the accounts that are signaling they are in research mode. "The integration helps us prioritize our target accounts inside Marketo, based on which accounts are most likely to buy from us," said Kari Hodgson, director of marketing, Couchbase. "It's very convenient. We segment audiences using the surge scores and topics, then deploy account-based campaigns with content, based on the topics that each account surged on." Prioritize target accounts based on which account has a higher chance of purchasing now. "We find that only 15-20% of any list of companies are actually in research mode to purchase. Understanding which specific companies are in that 15-20%, and the actual solutions they are researching, is essential to any B2B marketer," said Erik Matlick, chief executive officer, Bombora. "With the Marketo Engagement PlatformTM acting as the hub to make this understanding more actionable, there is exponential value to how Bombora's intent data can be leveraged across an organization." Matlick added that when intent data is added to account-based marketing campaigns or target lists, marketers typically realize a significant improvement in performance and account prioritization. To learn more about how Marketo and Bombora drive customer success, click here.